In recent months attention has focused on the very active tropical cyclone season in the Pacific Ocean brought about primarily by the strong El Niño which has developed this year. Meanwhile, the Atlantic has been very quiet with most tropical storms remaining fairly weak and only two reaching hurricane strength until now. 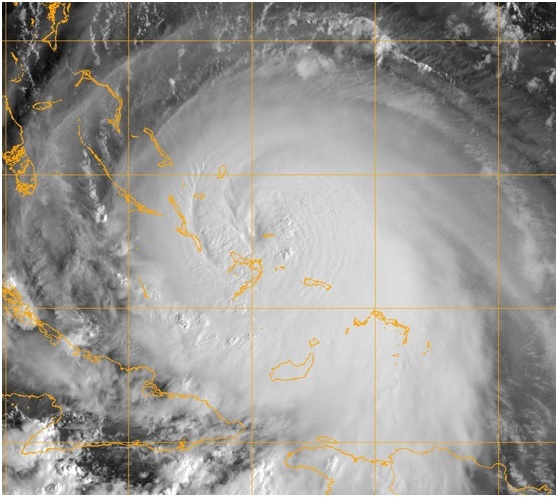 However, Joaquin has become the third hurricane of the Atlantic season and the second to achieve ‘major’ status – category 3 or above on the Saffir-Simpson Hurricane Wind Scale. Joaquin is currently lashing the Bahamas with winds in excess of 100 mph near the centre of the hurricane. A storm surge of over two metres is possible and rainfall totals could be as high as 500 mm. Once the hurricane starts moving away from the islands the big question is whether it will make landfall over the US east coast. Joaquin is currently slow moving near the Bahamas and all computer models agree that a gradual turn north will happen in about two days time. However, beyond this point there is great uncertainty as to what will happen. 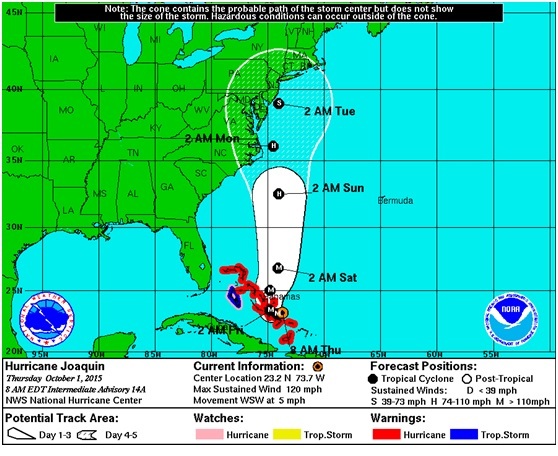 Joaquin is being pulled in two directions. A developing trough of low pressure over the USA would act to pull Joaquin westwards towards the US coast. However, an area of low pressure to the east – including the remnants of Tropical Storm Ida – would act to pull Joaquin east away from the USA. The situation is finely balanced and any of several outcomes could happen. One scenario is that Joaquin could make a turn north-westwards and make landfall near the Outer Banks of North Carolina at the weekend. Computer models are now mostly moving away from this as a likely outcome. Alternatively, Joaquin could take a mostly northwards track and reach New York and New England by early next week then continue up the eastern seaboard of Canada. Finally, a third scenario allows for the possibility that Joaquin could turn north-eastwards and avoid a US landfall altogether. We recommend that a close watch is kept on guidance issued by the National Hurricane Center in coming days for updates on which scenario is the most likely to occur. Irrespective of whether or where Hurricane Joaquin makes landfall on the US east coast, large amounts of rain are expected in this area in the coming few days due to a slow-moving frontal zone. The impact of this will be exacerbated if Hurricane Joaquin does take a turn towards the USA in the next few days with further heavy rain accompanied by strong winds and a storm surge. Hurricane strikes on the USA have been fairly infrequent in recent years – particularly those at the stronger end of the scale. In 2014 Arthur crossed the Outer Banks of North Carolina as a category 2 hurricane. Going back to 2012, Isaac came ashore over Louisiana as a minimal category 1 hurricane. In 2011 Irene made landfall on the east coast of the USA also as a category 1 hurricane. The USA avoided hurricane strikes altogether in 2010 and 2009, but in 2008 three made landfall, the most significant of which was Hurricane Ike which caused a huge storm surge as it came ashore over Texas as a category 2 hurricane. However, you have to go back to 2005 to find the last ‘major’ hurricane strike on the USA (category 3 or above), when Hurricane Wilma hit Florida. Hurricane Sandy (sometimes referred to as ‘Superstorm Sandy’) also caused much devastation to parts of the USA east coast in 2012. It is ranked as the second most costly hurricane in US history, although technically ceased to be a hurricane just prior to the time it made landfall. Official warnings for the latest tropical cyclones in the Atlantic are produced by the US National Hurricane Center. The Met Office routinely supplies predictions of cyclone tracks from its global forecast model to regional meteorological centres worldwide, which are used along with guidance from other models in the production of forecasts and guidance. We also provide updates on current tropical storms via @metofficestorms on Twitter. Will Joaquin affect the UK? With the confidence around the exact track of Joaquin being so low, it is currently too early to tell if this system will affect the weather in the UK. There is, however, already high confidence that we will return to more autumnal and unsettled conditions across the UK early next week. Make sure you keep up-to-date with the Met Office five-day forecast. This entry was posted in Met Office News and tagged England, forecast, heavy rain, hurricane, Met Office, National Severe Weather Warning Service, rain, rainfall, record, severe weather, Storm, storms, temperature, tropical cyclone, tropical storm, UK, weather, weather forecast, weather forecasting, wet, wind. Bookmark the permalink.